Besides my studies at the HWR I work partially in a sport store or more precisely, a Handball Store. Since the Handball world championship takes place in Spain these days our shop is booming. We are literally run over by enthusiastic fans who all were captured by the gigantic marketing machinery every big tournament brings along. In the beginning of January we got the newest collection of all handball brands such as Hummel, Select, Kempa or Adidas. MatchBalls, World cup shirts, shorts and shoes just launched for the upcoming championship. Our stores cash registers are ringing and so do the producer`s but what is so special about the marketing strategy that attracts so many fans and what is really behind all those expensive sport articles? If you watch a match in the current world cup you can always see the new commercials for the new products at the electric banners on the sidelines. The German Car Company kfzteile.de /WM also tries to jump on the bandwagon by offering a 0.5% discount for every German Goal. What´s really surprising for me is the fact that the advertisement does match to the current playing nationality. That means for German matches that there is always the DKB, intersport or mybet.de commercial. The highest German handball league hasn´t just a simple name like it is usual in soccer, like premier league or simply Bundesliga but it is titled after its biggest sponsor, the DKB Handball Bundesliga or former the Toyota Handball Bundesliga. This shows that handball is still in the shadows of its bigger brother “soccer” and is not popular enough to survive or compete with other nations without the help of big sponsors like DKB or Toyota. Nevertheless, this doesn´t discourage the sport industry to come up with brand new products. Since I am always in contact with those articles I had the chance to notice some things: Let´s take shoes as an example. Their colors keep getting glarier, the design more futuristic than ever before and guess what? The shoe that looks closest to a spaceship always wins! 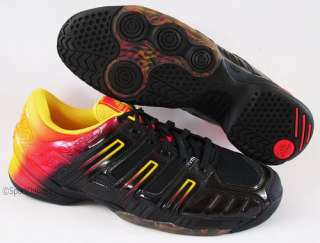 Here is an example of the “slightly” development of the same handballshoe model. I received a lot of customer complaints due to breaking plastic pieces in the front part of the spacy pair. The designs are changing but what about the production conditions? It is an open secret that cheap clothing chains like H&M or KiK employ adults and children in emerging countries for starvation wages in low quality mass fabrication. But the emphasize lies on cheap stores where you do not really expect high quality. And you can always check the red list which offers all brands that should be avoided. But isn´t it even worse selling at a high price level and producing in a low-cost manner? A research of the belgian consumer organization, Verbruikersunie, criticizes the blurry access to information about the prooduction processes and supply chains of the big firms like Adidas and Nike. The missing transparency makes it hard to evaluate their performance. If one believes the social and sustainability report of Adidas you can read their promise to fabricate under fair and environmentally-friendly aspects. But reading further in this 54 page long report is worth it because it provides a list with their producing plants and their problems like wages far beyond the wage floor. But on the other hand, Adidas is positively mentioned on the German webpage aktiv-gegen-kinderarbeit.de for its initiative for security in the factories. 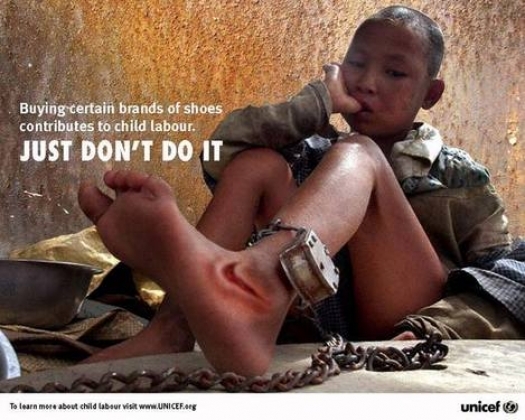 The “Just don´t do it”- campaign from UNICEF also clearly defines its opinion about Nike. Those are just examples of accusations against the sports industry. It just makes me sad when I compare the smiling and sparkling kids` eyes when they hold their brand new adipower stabil shoe from their idol in their hand with those wide-opened eyes of a starving kid who just stitched it. Is that the deal? One kid has to suffer for the other one´s happiness? I already made my decision. 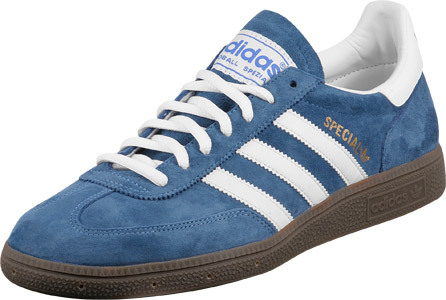 As long as there is no clear transparency of those mass product firms like Adidas or Nike I will try to stick with handball brands like Hummel or Kempa, which are both well-known for their fair Business even if my shoes are no spaceships then. This entry was posted in Investigative, Planned Obsolescence and tagged abuse, marketing, Sport. Bookmark the permalink. first of all: I absolutely LOVE your blog´s title! It was actually the reason why I started reading your post in the first place. Not because I´m into handball but rather because I had no idea what your post was going to be about – and I wanted to find out! The general title you chose might also have some downsides though: If a reader is particularly interested in handball and marketing for example they might not even consider reading your blog as the heading does not tell them what it really is about. Maybe you can try to combine a mysterious heading with a hint on what the topic is going to be about? Your first, bold paragraph gives a nice introduction into the topic; on the one hand it gives some background information about why you chose this topic and on the other hand it introduces the reader into the world of handball and marketing; nicely done! I like how you combine your great sense of humor with a professional point of view on the entire topic. Also, you really seem to have found a red line – taking the reader with you and leading them right into your topic. An idea when quoting from another web page or blog: instead of simply putting the url of the website into your post, maybe link the author´s name or the entire quote to the blog (Just like you did in your post with the red list). That way you don´t have these awfully long and confusing looking url´s in the middle of your beautifully designed blog post! When you get into the dispute between Nike and Unicef your post starts getting really exciting! You put one argument versus the opposed argument; nice implementation of conversational style!! In your final conclusion you sum everything up with your own opinion, also very nicely done! You did not only talk about the problem but even gave a solution which works for you – stick to companies which are transparent and fair. All in all a great blog post which I enjoyed reading a lot! Keep un the good work!! I would agree with Diana, your title catches the eyes makes us readers very curious about what you are about to write about. Wasn’t the world-cup couple of months ago? oh – that was soccer. Even though I do agree with a lot of what you have written, if I think about what we learned last week about “thinking prompts” – taking your first argument and then disproving it while showing a different opinion in a different angle only improves the post and makes it more sophisticated and interesting. What do you think? I appreciate your compliments about my blog post´s headline! It was really hard to find one because I touched so many topics in my blogpost. @ DIana, I changed the URL into a proper link! Thanks for that hint, I don´t know how we missed it! @ Itai, thanks for bringing up this statement. It made me really curious to read another different perspective about Child labor. Since my blog post is already very long, it would have been a bit too much to also include that topic. But nevertheless, this gave me more food for thoughts, thanks for that. And when I consider his arguments pro child labor I an a gree with him in some points. It was very important that you came up with that! Maybe you could explain me the second critique a bit more detailed on our wednesday class? Or show me what you would have done differently? I am curious about your minset! Guys, your thoughtful comments showed me that you were really interested into my post. This means a lot to me and proves me that i have done the right thing in some way! Generally I also have to determine like Diana and Itai did before: Gorgeous job, my dear!! Keep up your talented work!! First of all I guess that your inserted images found there great places within your article and support your message. By using the steps for better thinking, I really can notice that you combined the opinions of different professionals with smart and informative facts of nowadays situation. Nevertheless I had to agree with Itai… firstly it might be better to write as the ‘neutral’ part- means list ‘pro and cons’ of a variety of professionals-, above all take the part as an explorer, an obsever… a rubberneck. Later on you also can add your own view carefully… so the reader get to know why you are so frustrated about the situation. But no big deal- it also works great in current context…just as a hint for next time! Furthermore I love how you tell YOUR personal story- especially convincing as an introduction and conclusion. The effect is that you enclose the informative facts in a reader-friendly, smart and interesting context AND so you arouse emotions in reader’s mind and demonstrates that your are also a kind of “professional” in that field… wonderful, wonderful! All in all I just can say: actually a sad story but a breathtaking report from your side! Last but not least I have the pleasure to sending you the last lovely comment.